^ Undescribed cultivar of proto-regal. 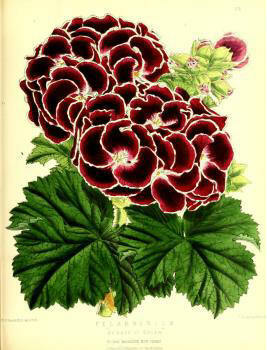 William Bull introduced the name "Regal" in his 1876 catalogue of New Beautiful and Rare Plants. 'Queen Victoria'. He still recognized the categories of Spotted, Show, Fancy and Hybrid Perpetuals. Henry', 'Princess Alexandra', 'Princess Beatrice', 'Princess Maud' and 'Princess Victoria' added. densely branched. 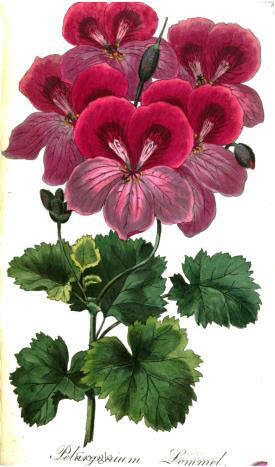 The raw material for today's cultivars was largely available in the early 19th century. 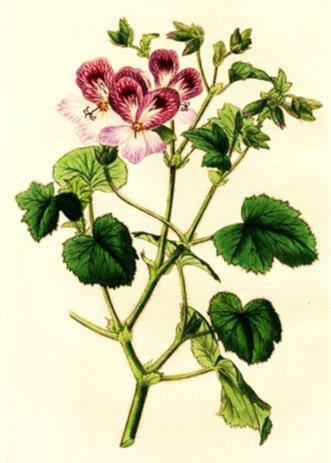 [Examples: Regals: vonReider 'Prince Charles', 'Koenig Salomon'; Sweet ' P. multinerve, P.
'Belle Henriette'; Sweet P. obtusilobum, P. pustulosum; Trattinnick: P. hesperidium, P. coriaceum. Plant breeders through the ages have had some common goals. Bigger is better. Different is better. wider petals became an almost universal goal. In 1841 in the Gardener's Chronicle, the following instructions were given for judging the "perfect"
a large dark spot running to the bottom as destitute as possible of a small white feather. 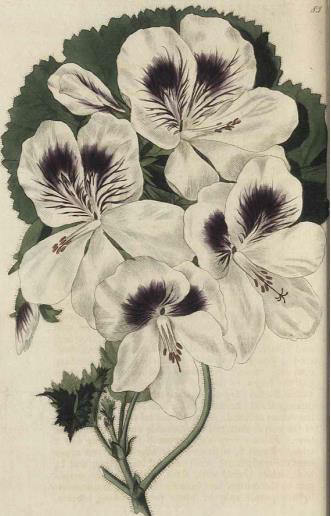 accuracy of form; large flowers also are in more request than the medium size" (Florist, 1848, p. 302). in the 20th century, the more fanciful, frilly, ruffled flowers came into vogue. and elaborate on what was there.